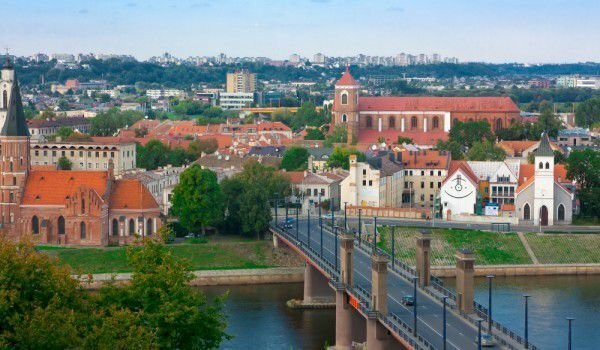 Kaunas is a Lithuanian town that is located in Kaunas region, which is the capital and administrative center of the region. The city has a population of about 322 thousand people. The name of the city name is Roman, they lived here hundreds of years ago. According to ancient legends Kaunas was founded by the Romans too. The land on which the city is erected, belonged to a man named Kunas. On the territory where today the town of Kaunas is located, people lived many centuries ago. The first settlement, which developed into the town is mentioned in a written document in 1361. At the end of the fourteenth century, for weaning the attacks of the Crusaders, a large stone fortress was built, which became an important part of the security system of the city. In 1362 the city was conquered by the Teutonic Knights, who destroyed the castle of Kaunas. The castle was rebuilt in the early fifteenth century. After 1408 Kaunas began to grow and become an active center for trade with Western Europe. At that time, Kaunas was an important port city. In the sixteenth century, in the city was built the first school, the first public hospital and the first pharmacy. At the end of the sixteenth century, Kaunas had the status of one of the most important cities throughout the Great Lithuanian Principality. During the seventeenth and eighteenth century the town experienced a period of decline. In 1701, during the Swedish campaign against Russia, the territory of Lithuania was destroyed. In 1657 and 1708 was an outbreak of plague, and in 1731 and 1732 much of the city was devastated by fire. In the late eighteenth century the economic situation of the city gradually began to improve, but in 1812 war broke out in which the army of Napoleon entered in Kaunas. During the war the city was twice destroyed and then restored. In 1862 here passed railroad tracks that merged the Russian Empire and Germany. In 1898 started working the first power station, which supported the development of trade and industry and led to a new dawn for the city. Yet there were factors that stopped the growth of the city, such as the construction of Fort Kaunas, which lasted from 1882 until 1915. The further development of the city was stopped because of the First World War. By 1919 the town was run by people from different nationalities. In 1919, when the Russians captured Vilnius, in Kaunas was located the state government, the Cabinet of Ministers and other important state institutions. In 1920 Kaunas was occupied by Poland. Then the city became a temporary capital of the country and became the most important Lithuanian city. After obtaining independence Kaunas significantly expanded, the population grew and developed important industries. Construction flourished when important architectural monuments were built as were whole new areas of the city. They were joined to downtown with bridges over the rivers Nemunas and Neris. In 1924 began to travel the first buses, in 1928 the city was built plumbing. A blooming period the city was interrupted by the Soviet occupation. After the war, Vilnius again became the capital of the country and Kaunas began to recover from war. At that time one of the most famous acts of protest against the Soviet occupation took place - in 1972 next to tge Music Theatre spontaneously burns the nineteen years old Romas Kalanta. This act shakes things up in the country. In 1988, rises the movement for release from the union and in 1991 Lithuania restored its independence from the Soviet Union. Today Kaunas is an attractive tourist destination with its beautiful churches and medieval buildings. One of the sights of Kaunas is a pedestrian bridge across the River Nemunas, which is very broad. It is peculiar in that it is tilted and looks like a ladder. The Park of the Nemunas River is very beautiful and it is walking young families with children, as well as representatives of all generations. Interesting is the Kaunas railway tunnel, which is more than a kilometer long. This is one of the oldest railway tunnels in Europe. It was built in 1862. In 2010 major repairs to the tunnel were made and it can now be actively used. Nemunas River has many beaches that attract tourists and city residents. The walk of freedom was made in the nineteenth century, it combines the old and new part of town and is only for pedestrians. The beginning and end of the Walk of freedom show east and west direction. Among the churches of Kaunas, one which is often visited by tourists, is the church of St. Michael the Archangel.